One of the disadvantages of barcodes on boxes is they are easily copied. 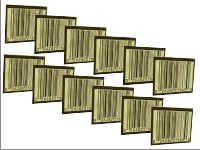 A person can buy an inexpensive item, remove and copy the barcode and stick it on an expensive item in the store and get past the checker without detection. This can not happen with Barcodes that are covered with Barcode Blocking Ink or Barcodes that are printed on top of Barcode Blocking Ink. Call us with your particular application so we can formulate an ink for your equipment. 1) Barcodes without blocking ink can be counterfeited. 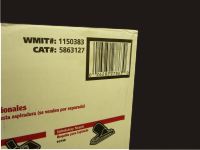 2) Counterfeit barcodes can be placed on many boxes and fraudulently returned. blocking ink can not be counterfeited. This video shows how Digital Magic Black ink prints at the exact same time as the carbon black ink. 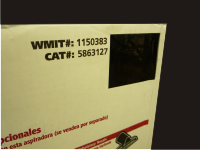 Infrared bar code readers can see the carbon black barcodes concealed in the black shapes. A specially converted Roland 6 head digital printer loaded with Magic Black Digital ink and special software produces same time printing of Magic Black with full color and/or spot colors. The value of this feature is the Magic Black and other colors are printed on the same substrate level, making masking much easier and topcoating more effective in obscuring covert barcodes or QR's. This technology could easily be used to imbed QR's and other digital media in public signage, giving covert operatives instant directions to locations or operational instructions.